A few months ago I went up against Canadian Heptathlete, Jessica Zelinka in the filming one of the CTV “How Tough is This Sport” segments. I immediately went home and signed up at a gym. My aerobic fitness wasn’t bad, but with each humiliating event that Jessica schooled me, my strength and particularly core strength were exposed – as missing. Wayne is just over 50 and he’s got a great family and a solid business; he’s happy. He also has a ‘What if?’ that has hung over him for almost 30 years. 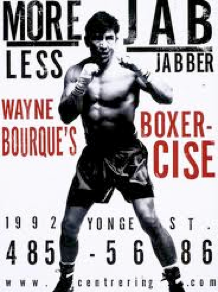 Wayne, from Fort McMurray, was on track for the 1984 Olympic team and had gone to Calgary to train for the Olympic Trials. On a day off he and his buddies went skiing. The athlete in him had questioned whether or not he should go, but the young man in him felt invincible; he wanted to break out a bit—have some fun…live a little. That day, he tore the ligaments in his knee. Wayne wonders about the lost potential of his Olympic experience often – what if he hadn’t gone skiing that day. In January 1992, just 6 months before the Barcelona Olympics I was goofing around with one of my housemates. We were wrestling and he clipped my knee from the side. I felt/heard my medial collateral ligament pop. Instantly I knew what I’d risked – and it terrified me. I was lucky that it was just the MCL and that rowers have zero lateral motion. I narrowly escaped that ‘What If?’…. I don’t want anything like this to happen to you. It’s a long journey to the Olympics and you have been making so many choices—putting sport, your training and recovery first. As much as you need to live your life your way – my suggestion this month is simply to keep your guard up. Stay the course a little longer! As you come into your competition season, you’ll be getting a bit more time and energy back. Listen to the athlete in you when you get bits of down time; make smart decisions when you are being adventurous. It’s possible that there will be injuries, hopefully just small and manageable ones, along the way. Be as aggressive as you can be with your recovery but be smart – you don’t want to experience setbacks. When you first start getting back to form, be careful about pushing yourself to exhaustion. When you’re body’s ‘health battery’ is topped up you can bottom it out and recover fairly easily. But charging the bottom half of your battery takes way longer than charging the top half. Know what you’re capable of and then try to leave one ‘bit’ left in your tank until your back to working with a fully charged- and healthy- body. Maybe you do need to bubble wrap yourself a bit. Personally, I never wanted to be a summer athlete injured by a winter sport, and if I was going to get injured… it would be rowing, or training for rowing that would do it. With your sport – you take informed and calculated risks on a daily basis. The Olympics start in 148 days; you need to push yourself. You can’t afford to be conservative, but you can’t be reckless either. It’s a fine line – remember your priorities—you can unwrap and go wild in 165 days! p.s. Between now and the 2012 Olympic Games I will be sending out a monthly email. Think of it as a talking point; you may agree with me, maybe disagree… It may serve as a heads up or reminder to some ups and downs that are a natural point of believing that you can more than just go, more than just compete, but compete at your very BEST at the Olympics. My goal will never be to add to your stress, but to help you wear it well. This entry was posted in Mentor Messages and tagged Bubble wrap, London 2012, risk, Wayne Bourque by Marnie. Bookmark the permalink.